Home > Liga I - Season 2010/2011	> Round 5 – results, scorers, standings and highlights! The round kicked-off with a surprise just for those who thought that everything’s fine at the champion club. Sportul exploited the visitiors’ arrogance and lack of determination, putting three past Nuno Claro, but could not end Mandorlini’s contract, well defended by a clause of 800.000 Euros. Bad news for the numerous players who thought that this was the way to get rid of their coach, starting with Lacina Traore, who finished an embarrassing display with a criminal attack that killed any hope of a fightback conducted by the once out-of-favor Sixto Peralta. Rapid managed to put behind the incredible loss against arch-rivals Dinamo, who continued their impressive start of the season with an away victory against a newly promoted, scoring 4 goals with just 10 men on the field! This was one of “those victories”, which prove that the Red Dogs are ready to use every weapon available to mount a serious title challenge this year. Which means that easy wins against clubs like Otelul, Astra or Universitatea Cluj are again on the cards. A bad thing for the competition, but good news for the informed bettors ;-). What was supposed to be this round’s derby, FC Vaslui – Steaua, was hardly an even contest, as the Bucharest side managed to score early in both halves and Lopez Caro’s men couldn’t find a way back into the game. 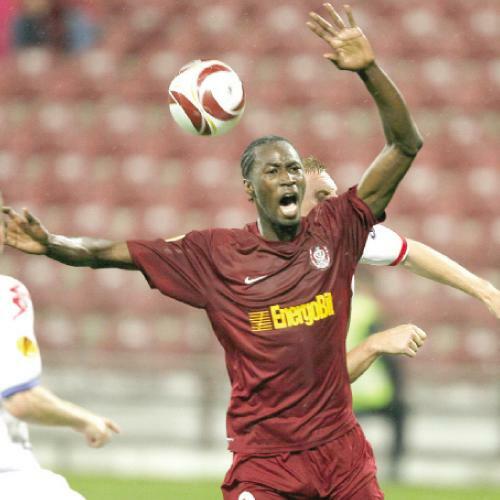 If Steaua has every reason to praise Romeo Surdu, who was an excellent replacement for the injured Kapetanos, FC Vaslui was betrayed by the club’s best attacking weapon, as Wesley missed a couple of golden chances. The round was closed by a less predictable draw between FC Brasov and Unirea Urziceni, but last season’s runners-up can be proud of their first goal in the league, scored by Bilasco. Apparently, his last for the club, as he’s stronly linked with a deserved move to Steaua. 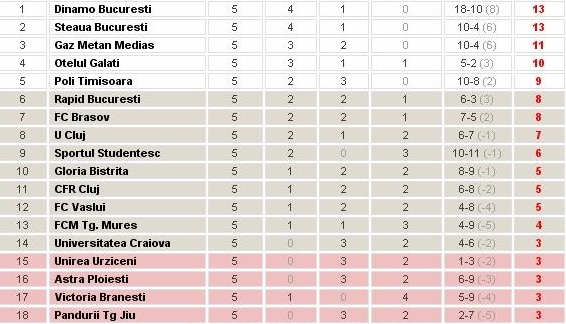 Round 6 (27-30 August): Gaz Metan – Rapid, Dinamo – Universitatea Cluj, Universitatea Craiova – Sportul Studentesc, CFR Cluj – Pandurii, Otelul Galati – FC Brasov, Steaua – FC Timisoara, Unirea Urziceni – FC Vaslui, Gloria Bistrita – FCM Targu Mures, Victoria Branesti – Astra Ploiesti. Romania has four teams in the Europa League. But not for long! Round 5 preview: Can CFR return to winning ways?